· 3 Bedrooms and 2 bathrooms with outdoor kitchen living area. 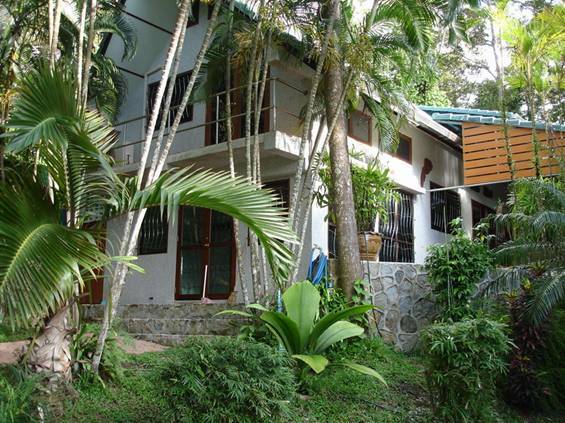 · All bedrooms have aircons & fans. · Fully fenced (1.1 rai) around big lush garden perimeter. Garden maintenance is provided. Price per month: Baht 32,000 payable in advance. Rental Bond Agreement: Two months rental in advance. 1. Lower bedroom is large with attached bathroom – air con & fan cooling with good ventilation from louvered windows and excellent garden outlook. 2. Upper bedroom is large with attached bathroom:- air con & fan cooling with good ventilation from louvered windows; Double doors open out onto a small balcony. Period Burmese teak shutters open, with outlook onto lower living area. 3. Upper mezzanine bedroom is smaller with aircon & fan. Good ventilation from large louvered windows on two sides. Designed to open out onto the garden, the living area is open plan with two sets of double doors which open up to the outdoor kitchen living area. The outdoor kitchen area is a utility area for cooking, barbeques, family gatherings and parties etc. It takes well to pungent Thai cooking. Kitchen benches are solid Casuarina wood. A back room (Secure breezeway) is used for storage and washing machine. An underground tank collects rain water for domestic use. · An alarm system is installed. · The land perimeter is fully fenced c/w 2 two gates. · Light sensors cover house access. 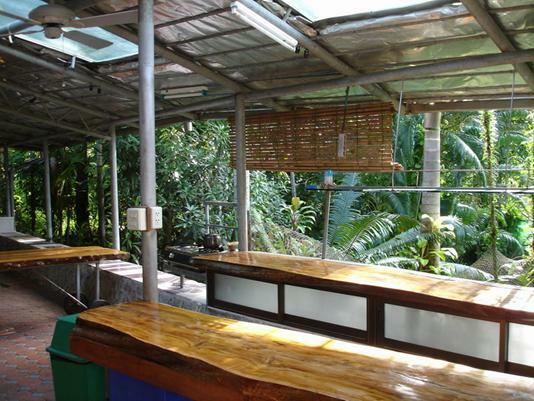 1.1 rai (1920sqm) is fairly big by Phuket property standards, the garden is established (approx 20years old) with some coconut palms which are sixty years old. Some trees have outdoor lighting installed switchable from the house, as is high pressure garden pump. The mainly palm garden is irrigated by an automated system. Garden maintenance is supplied owners representatives as/when required – This is usually once a month during the dry season and more often during the wet season. The access road (Hat Surin 4 Rd) is local and not busy. There are stairs / steps both inside the house and outside in the garden. Owners are proactive with garden maintenance. They can cater for most reasonable requests regarding setting up the house for your particular needs. Owners can be contacted as below:- Inspection of the house is by arrangement. Located on the east coast of Phuket. 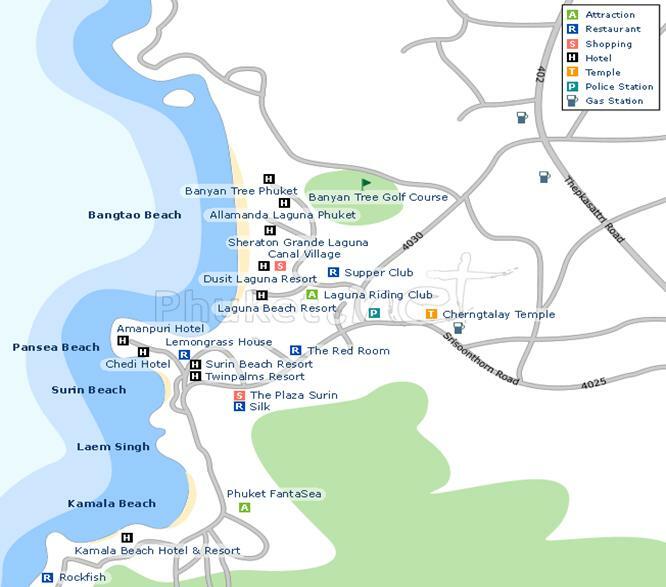 The beach is very popular with tourists and local expats with local bars and restaurants running along the south section and higher end restaurants and resorts at the other. 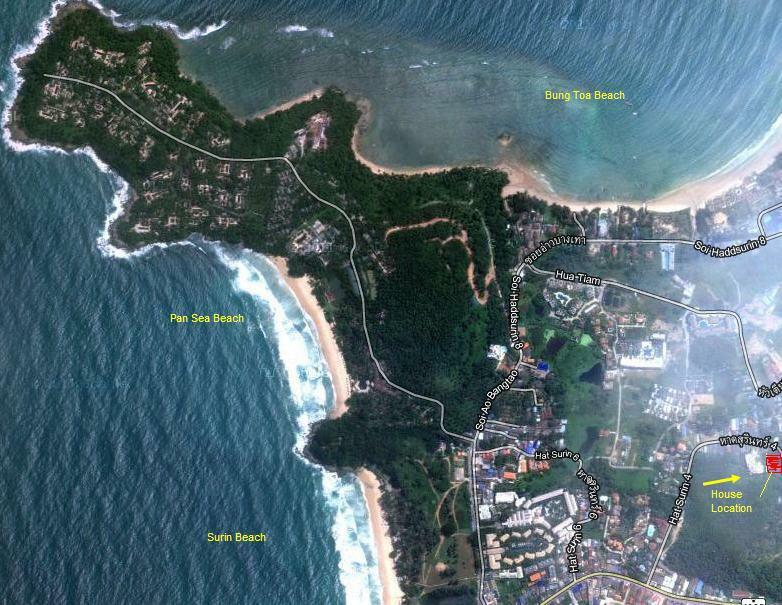 Bang Tao is just north of here and Leam Sing beach just south. Real estate and property available are luxury villas and houses as well as condominiums for sale and rent.